A credit is an action performed on a settled transaction whereby a merchant refunds an amount charged to a customer's card. Credits can be issued for part or the entire amount of a settled transaction. From the Product Hub, select Transaction Center. Enter any search criteria you wish in the search fields (or none if you so wish), and click Begin Search. The next screen will show all transactions that match the search criteria. Click on the magnifying glass icon in the left column next to the transaction you wish to credit. The Transaction Detail screen will display. Scroll to the bottom of the screen; you will see Perform Additional Transactions. In the center of the screen you will see Credit: Issue a Refund. 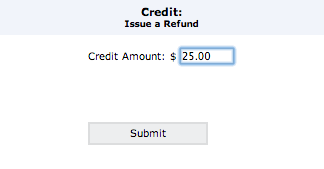 Type in the amount you wish to credit and click the Submit button. The search Transaction screen will refresh. You should now see the transaction you credited with YES in the credit column, with the amount of the credit displaying under amount. TIP: The credit amount does not have to be the exact amount of the transaction, but must be less than or equal to the transaction amount. If you issue a partial credit on a transaction and later need to refund an additional amount, you may do so as long as the sum of all credits does not exceed the amount settled. You can send your customer a receipt to show the account has been credited by clicking on either the receipt icon or email icon. The next screen will show all transactions that match the search criteria. Click on the magnifying glass icon next to the transaction you wish to void. The Transaction Detail screen will display. Scroll to the bottom of the screen; you will see Perform Additional Transactions. On the right, you will see Void: Void this Transaction. 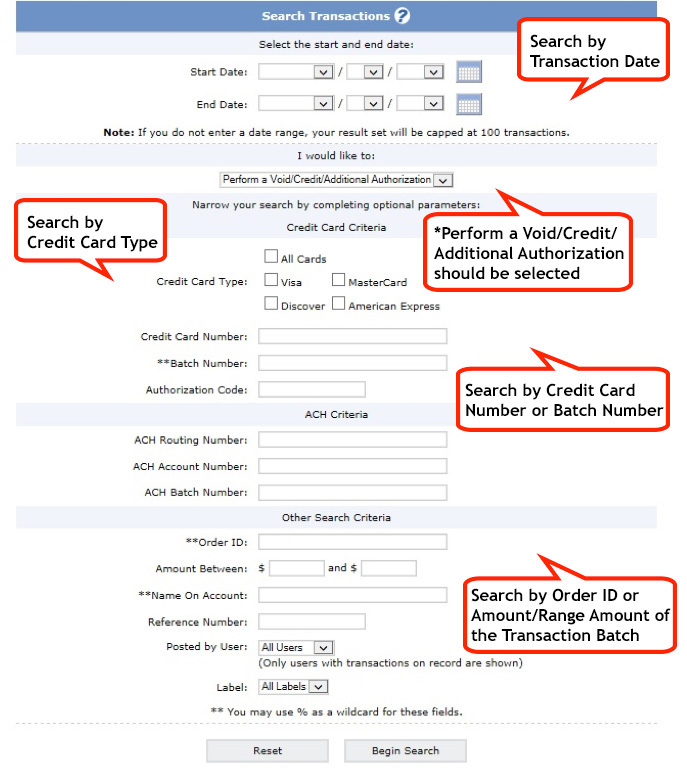 Click on the check box next to Void Transaction and click the Submit button. The search Transaction screen will refresh. 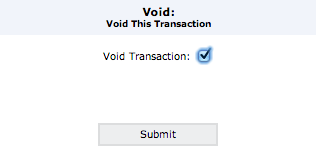 You should now see the transaction you voided with YES in the void column.